If you’ve ever worked in a restaurant kitchen you know the stress – pots clanking, plates clattering, beads of sweat dripping down your forehead, and every swing of that kitchen door comes with another order to be cooked to perfection. The pressure is on, and you’re in the zone, but the smallest interruption – like a customer returning a dish because your line cook didn’t know how to properly fillet a fish – is enough to throw you off track. A well-trained staff is a vital component to any kitchen running smoothly and presenting customers with a dining experience that makes them want to return. However, many of today’s generation of emerging chefs are coming to your kitchen without a degree in the culinary arts. They may have picked up some of their technique from working various kitchen jobs, but unfortunately, few can afford the resources necessary to pursue a classical culinary education and are therefore not equipped with all the cooking skills you need your kitchen staff to have. That’s where Richard Grausman’s book, French Classics Made Easy, comes to the rescue. In 1988 Grausman published his first cookbook At Home with the French Classics “as a way to document what [he] had been teaching,” he says. 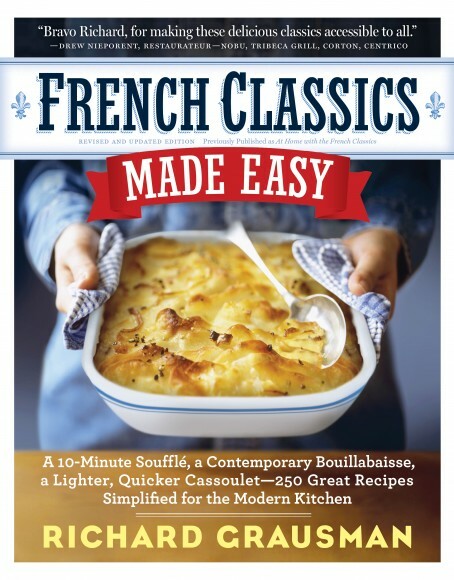 Grausman has now graced us all with a special gift, the re-release of his cookbook, French Classics Made Easy, which has been re-titled to reflect the nature of the recipes that fill its pages, “they are easy,” he insists. Grausman walks the future chef through every aspect of French cooking, from the first courses (soups, salads, omelets, and soufflés), to the main dishes (poached salmon and Beef Burgundy), followed by delicious desserts (Crème Caramel and poached pears). He even includes a section on the basic signature French breads, stocks, and sauces (Béchamel, Hollandaise, Béarnaise) – all while making a conscious effort to keep his vocabulary simple and sentences as concise as possible. Grausman’s collection of 250 carefully selected recipes evidences to cooks – beginners and professionals alike – what his students have known all along, Grausman truly does “take the fear out of French cooking.” Through his teaching methods, and now through the re-release of his cookbook, he has given underprivileged teenagers a priceless gift, the possibility of turning their dream to become a chef into a reality. French Classics Made Easy is a foolproof guide that is guaranteed to instruct your culinary staff in the tried and true techniques of classic French cooking. The cookbook can be purchased on amazon.com at the affordable price of $16.95 – just another way that Grausman makes his book accessible to the American cook public. francinecohen@insidefandb.com will win a free copy of French Classics Made Easy courtesy of Workman Publishing (www.workman.com). What is the title of the last article published on INSIDE F&B that mentioned the non-profit organization C-CAP? I am one of the lucky teachers from Philadelphia to have had Richard help my students to reach their goals. C-CAP is a wonderful program. Many of my students would never have had the opportunities that he has provided. He is an amazing man. I still use this book(the original). It is a great program and I’ve personally seen some graduates soar to big heights. It’s inspiring!